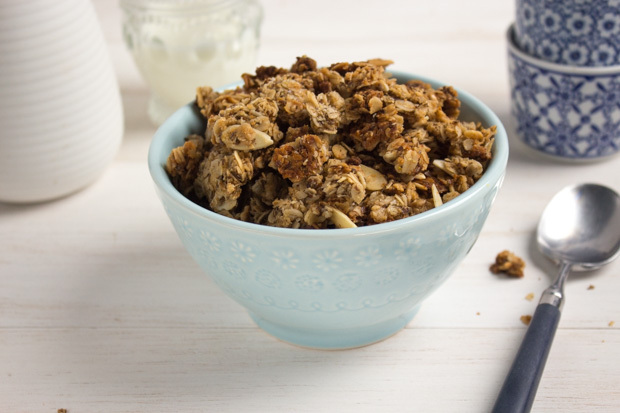 This granola is simple and delicious! Use it to complete your breakfast or as a snack. Preheat oven to 300º F (150°C). In a large bowl, mix oats, ground flaxseed, coconut, whole flax seed, almonds, cinnamon and salt. In another bowl, mix together milk, canola oil and honey. Pour over dry mixture, mixing well until evenly moistened. Press mixture onto a baking sheet and bake 20-30 minutes until oats are crisp and golden. Remove from oven and let cool before breaking into pieces. Store in airtight containers or plastic bags for up to 1-2 weeks. Serving Size: 75 mL (1/3 cup) Each serving contains 1 1/2 Tbsp (20 mL) flax. Serve in small bowls with cold or warmed milk or sprinkle over yogurt, fresh fruit or berries.